This engaging introduction to Thich Nhat Hanh will show you how one person can accomplish big things. This colorful book introduces you to the world of Thich Nhat Hanh, one of the most amazing people of the twentieth century—and today. You will be inspired as you learn about Thich Nhat Hanh’s life—from his work to end the war in Vietnam, to his eventual founding of the Plum Village community in France—and his teachings about peace and "mindfulness" in the world. 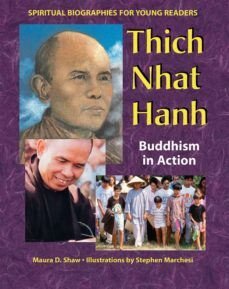 Through enjoyable biography, activities inspired by Thich Nhat Hanh’s values and beliefs, and poems written by the teacher himself, Thich Nhat Hanh: Buddhism in Action will show you how to be braver, more caring, and happier in your own life.